For this trip, Riley and I had plans of trying to catch Walleye but changed our minds after we got on the ice and located Perch. 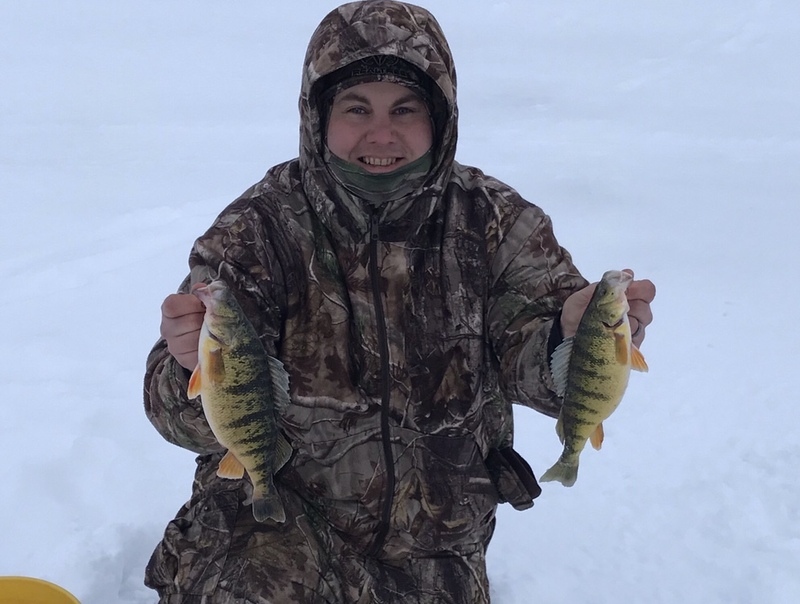 Our previous trip was filled with little Perch while trying to catch Walleye, so naturally we decided to try and figure out how to catch the bigger fish. We started out using bee moth and jigs tipped with minnows, as seen in the picture below. The fish we located were in twenty feet of water where we spent the majority of the day. Each time a school came through we would catch little Perch. Leaving fish to find fish is not something we are going to do; instead we changed presentation and baits. It didn’t take long to figure out that when a school of fish came through, the big ones were suspended above the smaller ones. The first time our screen lit up I raised both rods and hit a double! This continued for a couple of hours until the wind switched directions and the barometric pressure started to climb. The bite had slowed down which made things bad, but also now the only fish we could catch were pinned to the bottom! It appeared, after the pressure and wind direction change, that bee moth were working just as well for bait. Two hours before dark, the bite had all but shut down so Riley decided to try a shallow flat. Well, he made the right decision because as I sat in the same spot hoping for one more bite he started catching fish. It was one of those days where the weather couldn’t make up its mind and seemed to change every two hours. All we could do was keep changing techniques and try to keep up with the fish. I am sure nothing will be the same on our next trip but, as always, it taught us another lesson. You can sit in one spot doing the same thing and wondering why the fish aren’t biting or you can keep trying new things until you figure out something that works.